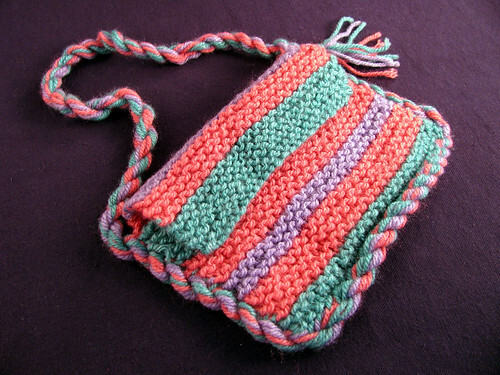 Here is the sample purse I used when I taught the 2nd graders how to knit. It is just a folded garter stitch rectangle. The sample has been folded in a plastic bag for a while and that is why it looks so mussed. I had lots of different colors of pastel yarns for the girls to choose from. The pattern was typed leaving an underlined space for the students to write in the color they wanted for each stripe. I stressed the uneven stripes to help them count their rows. The girls all made straps that were longer than the one on sample so they would have shoulder bags. Twisting the straps turned into a fun activity. They all liked their bags so much that when I was given the opportunity to enter their projects in the county fair, most declined. The fair would keep the projects over the summer. One of my friends talked her daughter into entering. It wasn’t the best from the class and had a couple of holes. It won first place in it’s division anyway. This entry was posted on Thursday, March 5th, 2009 at 5:35 pm and is filed under Knitting. Tagged: Knitting. You can feed this entry. You can leave a response, or trackback from your own site. I love the twisted strap!